Treat yourself to a fancy blended coffee drink that tastes like dessert without neglecting your diet. This Vegan Mocha Caramel Latte Shakeology smoothie, made with Café Latte Vegan Shakeology, unsweetened chocolate almond milk, and buttery caramel extract will help you curb your cravings and stay on track. Treat yourself to a sweet, fancy coffee drink without neglecting your diet. 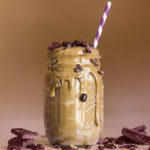 The Vegan Mocha Carmel Latte Shakeology smoothie will help you curb your craving and stay on track. Place almond milk, ice, Shakeology, and extract in blender; cover. Blend until smooth.